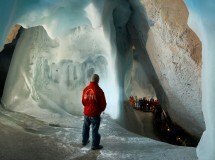 The Eisriesenwelt in the nearby Werfen houses the largest ice caves in the world. The caverns total 42km in length, with the first kilometer covered in ice. There are guided group tours of this initial part of the cavern network. The caves are accessed from Werfen via a steep paved road, followed by a few hundred meter climb in a small gondola, and finished off with an approximately 20 minute hike.